This morning we took a long bus ride to cinque terre, or the 5 villages. We arrived at the port where we spent about 45 minutes while waiting for the tour boat to take us over to Monterosso, one of the towns. We were originally supposed to visit two of the towns, but the water was too rough for the boat to stop. The boat ride over was a little rough for some of us, but Monterosso was beautiful. The water in Italy is an amazing deep blue/green color and with the mountains in the background it was truly a site to see. We had about 2 hours to ourselves to eat lunch and shop. I went to a small restaurant with a couple girls, and half us us got spaghetti pesto, while a couple other girls and myself got spaghetti Ciak (pronounced chock) which was pass with seafood in a light tomato sauce. Both dishes were mixed and served right in front of us and both were delicious! After a lot of us stop in a small store to buy pasta, pesto, and other food goods to bring back. 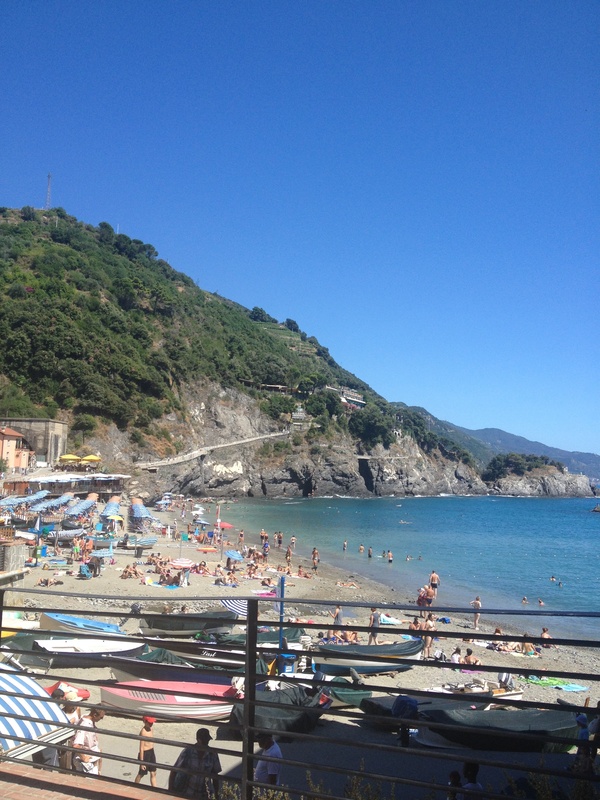 We ended up miss judging the time the train was supposed to come in, so we had another hour in Monterosso, so 5 of us (myself, ali, kate, kim, and megan) decided in the moment to try and cliff dive after we got permission, so we ran to a store to buy bathing suits and ran back to jump . Unfortunately we weren’t actually allowed to jump of that spot, but we still jumped off some rocks off the beach. It’s pretty cool that we can say we went swimming in the Mediterranean sea, even if it was only for 10 minutes. At night we had a meal at the stadium, and then played against a local club team. Unfortunately we lost, but we played well, especially since we haven’t played together in a couple months. It was interesting to see how the other team played, I wouldn’t say they were less aggressive, but they knew how to shield the ball when they had possession. This was a great learning experience.